Company owner Max Crespo unveiled the Neapolitan Express in February alongside New York Mayor Michael Bloomberg (I) and legendary energy executive T. Boone Pickens. In partnership with Pickens' Clean Energy Fuels Corp., Crespo is now rolling out the concept across the country. 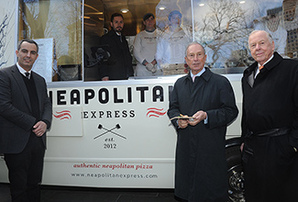 A pizza food truck that runs entirely on compressed natural gas was launched in New York by its owner, Max Crespo (right), Mayor Michael Bloomberg (center) and T. Boone Pickens, a major promoter of using natural gas as a transportation fuel. Photo courtesy of Neapolitan Express. "Clean Energy has been part of many 'firsts' in the natural gas transportation fuel business, but the partnership with Neapolitan Express may be the most unique and exciting," Pickens said at the launch. Neapolitan Express uses compressed natural gas (CNG) to run everything from its engines, to its ovens, to an electric air conditioner and all other appliances. The food truck reportedly produces 70 percent less carbon emissions and reduces fuel costs by 60 percent over gasoline and diesel-fueled versions. It also eliminates the need for highly combustible propane tanks. With the environmental, economic and safety benefits it offers, Crespo's truck could have the right ingredients to revolutionize the food transportation industry. "I'm not a pizza truck company. That's not what I am. That's one of the things that we are, but we look at ourselves as a disruptive technology," Crespo said in an interview. "We try to change the way an industry operates when it comes to the fueling as well as the food side of it." The food truck business model is blowing up across the country. But a major concern is that the trucks themselves are literally at risk of exploding. Last year, the Fire Department of New York City identified food trucks as a "transient hazard," and in 2011 two brothers were severely burned in a food truck explosion on New York's West Side Highway. There are often three fuels required to make food on a vehicle that moves: diesel for the engine, propane for the kitchen appliances and gasoline for a generator to power the interior lights and any electronics. "So you have all of these multiple fueling sources mixing with a spark-ignited engine and open flames," Crespo said. "It's basically a Molotov cocktail." Crespo got into the world of food trucks nine years ago. Like everyone else, he acquired an old delivery truck, cut a hole in the side and installed cooking appliances. The process wasn't exactly smooth. Crespo once blew the back of a step van clear off in trying to adjust the oven temperature. "It went kablooie," he said. But even when he succeeded in making the truck functional and safe, he found managing three fuel sources to be costly and inefficient. He looked into different fuel options, but nothing stuck. Biodiesel burned loudly and smelled, and electric vehicle technology had a cripplingly high price tag and limited functionality. Finally, he explored natural gas and found it could meet all of his fueling needs. Using his own capital, Crespo worked with the company Green Alternative Systems to convert his first three trucks to run on CNG. Through the partnership with Pickens' Clean Energy Fuels, Crespo plans to build 20 more trucks by the end of the year. But he won't stop there. According to Crespo, there will be "a lot more next year, a lot more." Cheap, domestic, abundant natural gas has made CNG and liquefied natural gas increasingly attractive fuel options, particularly for trucking fleets looking for price stability and fuel savings. Waste Management Inc., a Texas-based waste and environmental service provider, is among the leaders in CNG adoption. But for Crespo, work vehicles make poor mascots for the valuable fuel. "We've linked our brands to garbage. Great. That's about as marketable as the bottom of my foot," Crespo told proponents of natural gas in June at the Alternative Clean Transportation (ACT) Expo in Washington, D.C.
"I believe when it comes to marketing and building a brand, a food truck is the best possible way to do it, especially because it appeals to millennials. And what do millennials want? They want something high quality and something that's good for the Earth; they believe in doing things for social justice, for the greater good," Crespo said. Peter Grace, senior vice president of sales and finance at Clean Energy Fuels, agreed that Crespo's "crazy idea" could benefit the entire natural gas industry. "A lot of the things that have been very popular with natural gas or CNG are kind of behind the scenes: Nobody gets too excited about their garbage getting picked up. Nobody gets too excited about a transit bus or a long-haul truck. The consumer doesn't relate to it," Grace said. A food truck, by comparison, "is a vehicle that they can touch every day and see every day, maybe get lunch at every day. So from an awareness perspective it is a good face," he added. "It's cool." Less-than-glamorous segments of the trucking sector will be the biggest users of natural gas fuels for years to come. But putting natural gas in front of consumers could help increase its adoption by highlighting the fuel's ability to reduce costs, dependence on foreign oil and emissions, according to Grace. There have been other attempts to raise the public profile of natural gas fuels. A collaboration of America's Natural Gas Alliance (ANGA) and the American Gas Association (AGA) recently retrofitted six prototype passenger vehicles -- the BMW X3, Honda CR-V, Hyundai Sonata, Ford Mustang GT, GMC Acadia and Chrysler 300 -- to run on both gasoline and CNG. The demonstration project was designed to showcase the potential for natural gas to power everyday vehicles. But no timeline has been set for when these cars might reach the market. "We're trying to make it relatable to people, show people we have the technology today," said Daniel Whitten, spokesman for the ANGA. "We understand we need to grow the infrastructure; we've got to build this out, that's part of what the fleets are doing. But you can imagine a world where natural gas vehicles, whether it be a food truck or a Ford Mustang, could be available and accessible for everyday people." Crespo said he sees the next big opportunity for CNG in the refrigerated truck sector. Like a food truck, refrigerated vehicles need both mobility and on-board power generation. People rely on them to deliver perishable products to grocery stores and restaurants. But at the same time, they spew emissions into the communities they serve. In the South Bronx, community members are fiercely opposing plans to relocate the online grocery company FreshDirect's operations to Harlem River Yards, citing environmental and health concerns related to its delivery trucks. The Community Board approved the move last month, but opponents have pledged to continue fighting the decision. Converting the trucks to run on CNG would significantly cut down particulates and other asthma-causing emissions. CNG also produces up to 25 percent less greenhouse gas emissions than gasoline or diesel. "It's not a panacea, because natural gas doesn't get you to the greenhouse gas emissions reductions we need to mitigate the worst effects of climate change," said Nick Nigro, senior manager of transportation initiatives at the Center for Climate and Energy Solutions. "But it can certainly be part of the solution if it's used strategically."